Daniel Castellanos stood between two nectarine trees that were two feet apart and just about his height. He shook their branches, working his way from bottom to top, trying to find out how much fruit they were carrying this close to harvest. It wasn’t much: There were only one or two nectarines per branch. “These are trees that should be giving us lots of fruit by now,” he told me in Spanish. But a few weeks before my visit to the farm, it froze overnight. Then, the next afternoon, the temperature rose into the 90s, ruining a lot of the crop. Castellanos is what’s known here as a mayordomo, a crew supervisor who monitors the work done at the farm and addresses the farmworkers’ concerns. His boss, Vernon Peterson, ensures that the mayordomos enforce labor laws. Peterson’s family has owned Abundant Harvest Organics, a stone fruit farm in Kingsburg, California, since 1893. Over 6 feet tall and with light blue eyes, Peterson towers over his 100 workers, addressing them in Spanish whenever he crosses paths with them in the field. Castellanos looks every bit like an American’s idea of a typical Mexican farmer, with his little charro mustache, wide-brimmed straw hat and plaid cotton shirt buttoned almost to the neck. He got his start as a farmworker in his late teens, working for minimum wage in California’s Central Valley. These days, the men and women don’t spend more than eight hours a day working in the fields, but that work is done in increasingly warm temperatures. The impacts of climate change are being felt not just in the quality of the harvest, but in the economy and the daily lives of the people who labor in the fields. It used to be that exposure to pesticides was the top health concern for farmworkers; today, heat exposure is. For the people who pick the country’s fruits and vegetables — an estimated 800,000 during peak season, about half of them in California alone — higher temperatures mean uncomfortable working conditions, a risk of serious illness and even the possibility of death. In California, there are already strict laws and regulations on the books to prevent some of the worst consequences. But as the future keeps warming, those may not be enough. 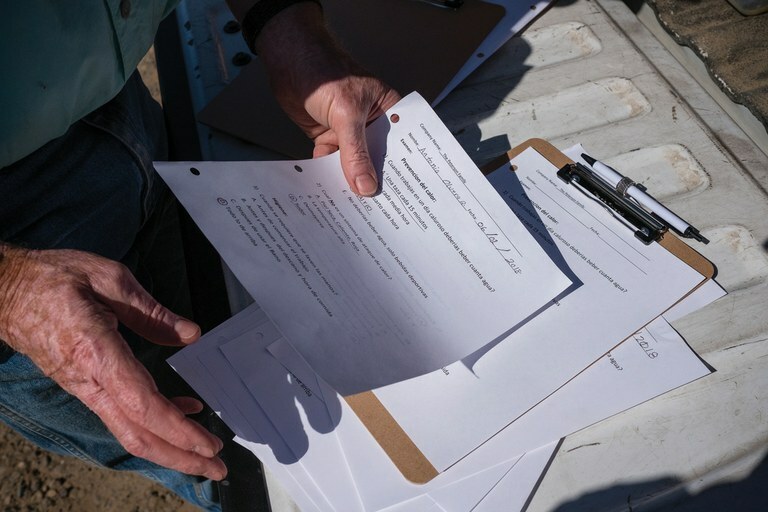 Abundant Harvest Organics owner Vernon Peterson sorts through questionnaires testing his employees’ awareness of heat-related illness, following a monthly safety training session. There was a water cooler a 10-minute walk away from where the workers stood, but according to Bautista, the mayordomo wouldn’t let them take a break. Even after Vásquez Jiménez collapsed, farm management didn’t immediately take her to the hospital. By the time a doctor finally treated her, she was in a coma, with a 108-degree fever. Two days later, she died. Vásquez Jiménez’s employer, Merced Farm Labor, was fined $262,700,and the company was eventually forced to close its doors. California’s Labor and Workforce Development Agency later found that the farm had had its business application renewed, despite its failure to follow heat illness guidelines. 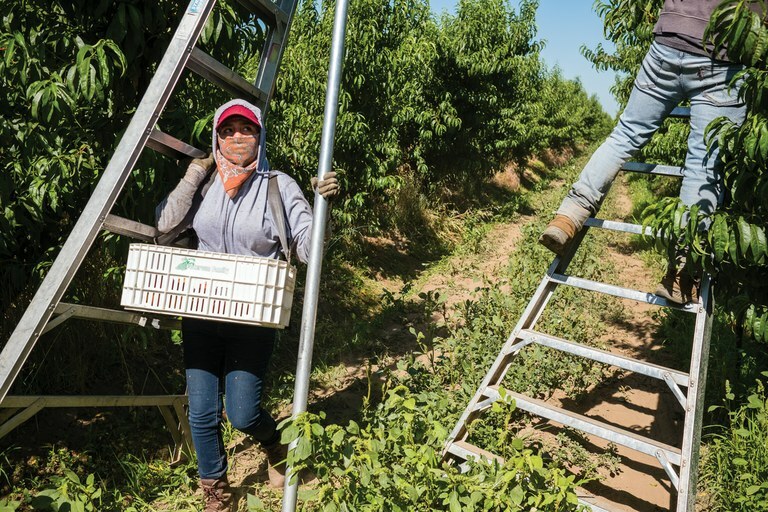 Elsewhere in California, state labor inspectors found that more than half of the farms they audited did not follow the rules. Over the past decade, at least 24 farmworkers have died from heat-related causes, including Maria Isabel Vásquez Jiménez. 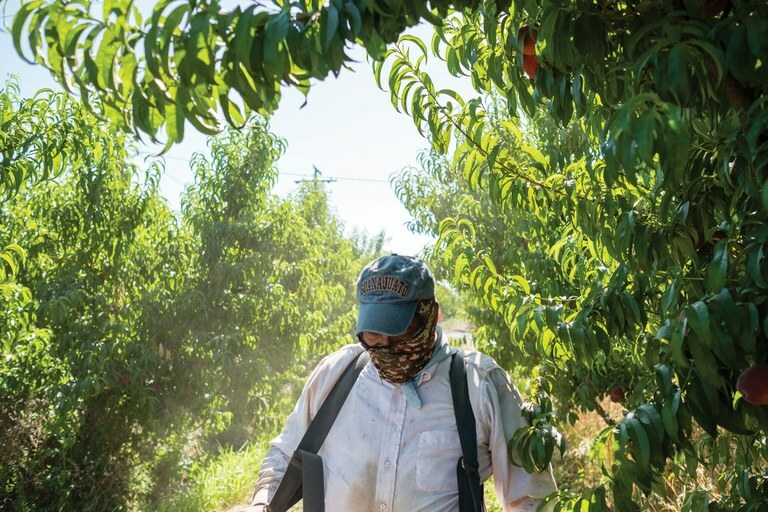 Covered from head to toe to protect himself from the sun and dust, a farmworker picks peaches in an Abundant Harvest Organics orchard on a typically warm June day in Kingsburg, California. Still, when it comes to labor protections, California and Washington are ahead of the federal government and most other states. Many states, including Oregon, issue heat exposure recommendations for vulnerable populations like fieldworkers but do not enforce them. California passed the nation’s first heat illness law in 2005. It requires farms to conduct training on prevention and write emergency plans in case workers get sick. Farmers must supply water and shade for employees during their breaks, or face stiff fines. But the state also exemplifies the challenges posed by climate change amid our culture’s endless pursuit of productivity. Today, California’s agriculture is valued at more than $50 billion a year — $6 billion in the Central Valley alone. The state produces more than two-thirds of the fruits and nuts and about one-third of the vegetables consumed in the country. Whether the crops are conventionally grown in gigantic industrial farms or come from small organic operations like Peterson’s, the current level of productivity will become unsustainable, if not obsolete, by 2060. A recent paper published in the journal Agronomy by University of California researchers shows that the average annual temperature in the Central Valley region is projected to increase by 5 to 6 degrees during this century. Extreme high temperatures are expected to last from June to September (twice as long as they do today), with heat waves that will be longer, more intense and more frequent than they were a decade or two ago. Add to that the powerful drought-to-flood swings, or “precipitation whiplash events,” such as the heavy rains last winter that are partly to blame for Abundant Harvest Organic’s less-than-abundant yield this spring. Marbella Cruz, a former fieldworker who now works for a Cal/OSHA contractor, leads monthly safety trainings at one of the Abundant Harvest Organics peach orchards in Kingsburg. IT WAS A PLEASANT 85 DEGREES in the shade in early June when Peterson, Castellanos and a crew of about a dozen workers sat for 10 minutes to listen to Marbella Cruz, a former fieldworker who now works for Gar Tootelian Inc. Known locally simply as Gar, the company has a contract with California’s Occupational Safety and Health Administration (Cal/OSHA) to oversee farmers in the Central Valley. Cruz trains workers and their managers on the prevention of heatstroke, and about once a month, she makes the rounds to enforce labor policies designed to prevent injury and illness. In the past 10 years, she has not witnessed a single heatstroke incident at any of the more than a dozen midsized farms she oversees in the Central Valley. Her monthly worker safety and compliance training begins with a handout — a list of six multiple-choice questions in Spanish, asking things like, “When you work on a hot day, how much water should you drink?” A couple of the workers shout out the right answer: a cup every 15 minutes, or about eight cone-shaped paper cups an hour. Don’t wait until you’re thirsty to drink, another says. 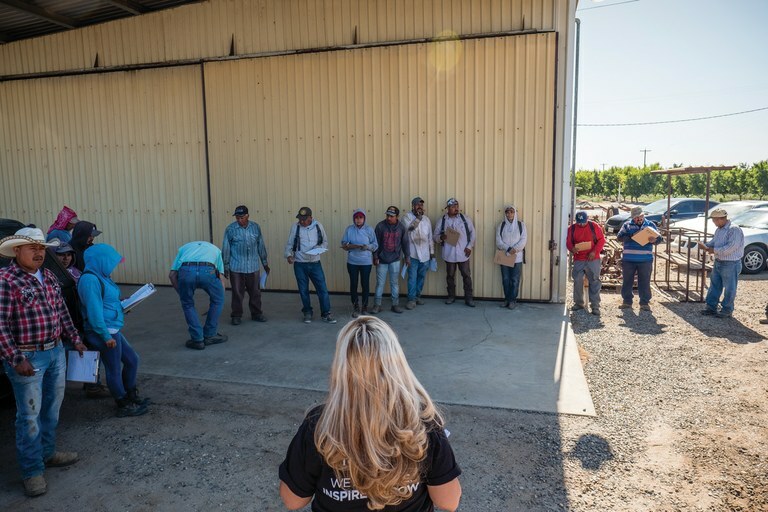 Researchers from the Western Center for Agricultural Health and Safety at the University of California at Davis regularly visit farms like Abundant Harvest Organics, trying to develop the best training for fieldworkers. They have been gathering evidence of the physiological responses to heat and physical work among Central Valley fieldworkers since 2014. 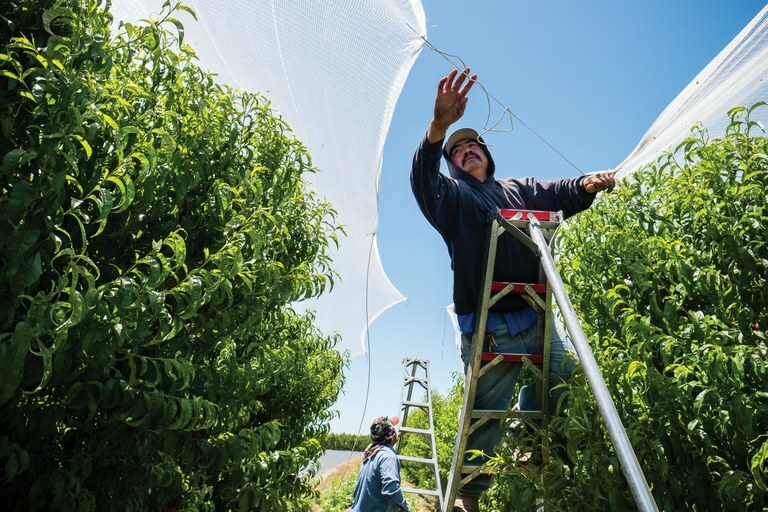 Farmworkers harvest peaches at one of Abundant Harvest Organics’ orchards in Kingsburg, California, where, as temperatures continue rising, awareness about heat-related illness is critical to farmworker safety. They measured the workers’ heart rates with the help of monitors strapped around their chests, and tracked the intensity of their physical activity using accelerometers attached to their belts. They also monitored how hydrated — or dehydrated — the workers were at the start and end of their shifts, by drawing a few drops of blood. CHIPS is also recording the variations in how heat illness is perceived by different genders and cultures, while considering ways in which any gaps in information and communication can be bridged. Even when it’s completed, the study may not be able to give us a full sense of how well the heat illness law is being enforced. But it will help researchers understand the combined impacts that physical labor, weather and crop type can have on the health of farmworkers. Historically, farmworkers have been neglected in public-health circles, especially outside California. Most studies of the physiological effects of working in hot conditions have concerned military personnel or firefighters. When Cruz’s training session ended, everyone took a quick lunch break next to the orchard. Gilberto Aguayo sat on his cooler and turned on a hot plate, warming up homemade corn tortillas he then filled with a bean and tomato stew. He’s been at this farm for about eight years, he told me, making a minimum of $11.50 an hour, and as much a $19 an hour in the summer, depending on the weight of his harvest. There is a lot of fruit to pick (though not as much as the spring harvest) from July to October. Unfortunately, that is when the heat is at its worst. “Peterson is a good person to work for,” Aguayo explained. “He looks after the workers to make sure they’re safe, and he doesn’t try to cut corners by paying less or by pushing them beyond what they can physically deliver.” But he’s heard stories about other farmers in the area who fail to comply with safety regulations, or refuse to pay workers a decent wage. He knows farmworkers who would be happy to find a steady gig at a place like Abundant Harvest. Farmworkers here are paid what’s called a piece-rate wage for every bin of fruit or vegetables they harvest over the course of their shift. This means that the more breaks the workers take, the lower their wages will be. Yet one of the first recommendations for people experiencing heat exhaustion is to find shade and take a break, for at least an hour or two. If an employer fails to enforce the heat-illness law, piece-rate workers are likely to hesitate to complain or slow down their pace for fear of losing their jobs. A farmworker removes protective netting from a row of peach trees before harvesting the fruit. BY NOON, the temperature had reached 90 degrees. We climbed on Peterson’s pickup truck and drove past the rows of peach, plum, pluot, nectarine and almond trees that his family has tended here for over a century. Back when the Petersons started farming, the Central Valley was a bucolic landscape dominated by orchards. The region had perfect growing weather and rich soils, and the land was split into smaller parcels than you’d find today. But by the time of the Great Depression, agriculture in the valley had become increasingly intensive, and therefore more dependent on migrant labor, as well as on irrigation using water from canals and aqueducts from the northern part of the state. Typically, every spring, Peterson found extra help among high school students on summer break or the sons and daughters of longtime fieldworkers. In years past, there would also be migrant workers here from Mexico — people who’d crossed the border with a guest-worker visa or without papers, eager to send some money back home. But now, he said, it’s hard to find either type of worker: Students are increasingly looking for better-paid work inside offices or in internships in cities, while migrant workers can no longer cross the border as easily as they used to. And once they’re here, they’re afraid of being caught and deported. In the future, labor shortages will likely continue to be a serious concern for farms like Abundant Harvest Organics. As Peterson said, that means that running a small operation like his will no longer be as financially or logistically sustainable. Back in Peterson’s air-conditioned office, our conversation shifted to the challenges of growing food today as a small or medium-sized farmer, in an era of man-made climate change and industrial agriculture. Despite the recent weather problems, Peterson remains skeptical of climate change. Peterson doesn’t regard climate change as settled science, and he believes that it conflicts with his religious views. In fact, he won’t even utter the words, preferring instead to just use the term “weather” to refer to the environmental shifts affecting his farm these days, from rising temperatures and drought to the increasing problems with pests. Still, he takes the health threats faced by his workers very seriously. Ever since Vásquez Jiménez’s death, the United Farm Warmers Union has pushed for tougher enforcement of regulations on farms like Peterson’s. In 2015, Cal/OSHA settled two lawsuits brought on by the UFW on behalf of five farmworkers, winning, among other things, the right to help update the agency’s guidelines. That led to stronger protections: Employers now must keep water closer to the workers and give them 10 minutes of break for every two hours of work, as well as shade as needed throughout their workday. And most recently, the state’s Labor Commissioner’s Office has begun to enforce a law that requires employers to pay their piece-rate employees for their rest breaks, too. According to Peterson, most farmers in the Central Valley aren’t “bad actors” and would follow state worker protections, with or without the threat of stiff fines. While he believes in treating his workers with respect and care, Peterson also says that California’s farm industry has become too regulated during the past 15 years. That translates to higher costs of doing business for him, he said — around $5,000 extra a year for a farm his size. But even though Peterson would prefer fewer state rules, Abundant Harvest Organics’ mayordomos continue to faithfully follow the updated directives. And the farm has an important rule of its own, one that it will be enforcing this summer as the temperatures rise. Note: This story has been corrected to reflect that the state’s Labor Commissioner’s Office is the agency in charge of enforcing labor laws as they relate to farmworkers paid a piece-rate, not Cal/OSHA.